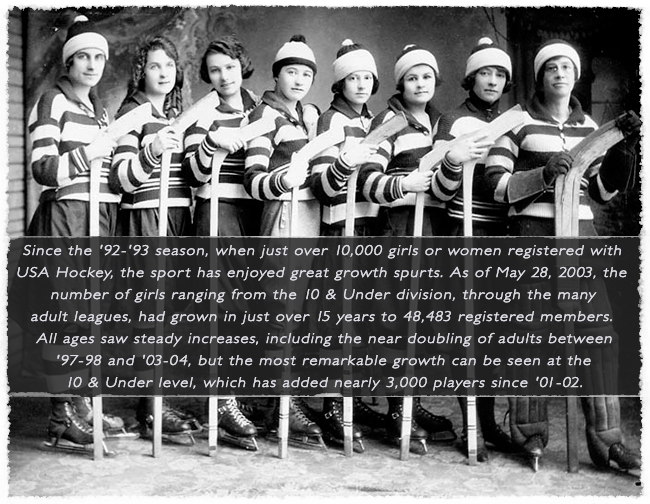 You may be surprised to learn that girls and hockey go back over 100 years. Isobel Stanley, the graceful skater in white, was the daughter of Lord Stanley of Preston. This photo, taken at Ottawa's Rideau Hall, residence of the Governor General of Canada, is the earliest snapshot ever taken of women playing hockey. Around 1890, Lady Isobel Stanley, daughter of Canada's Governor General at the time, was one of the first females to be photographed playing hockey. played "shinny" with other ladies on the ice rink beside Government House in Ottawa. Isobel had visited the Montréal Winter Carnival in 1888 and watched a men's hockey game. She and two of her brothers fell in love with the game and they began playing it themselves. They even convinced their father, Lord Stanley, to donate a trophy for hockey, which became known as the Stanley Cup. Had he realized that women's hockey would become so popular, Lord Stanley probably would have provided a second trophy, perhaps called the Lady Stanley Cup. In the early days, many women players didn't like to have an audience watch them play. One newspaper reporter who managed to see a game in Saint John, New Brunswick, reported in the Ottawa Citizen on February 11, 1891, that some of the women "are very swift skaters and they can dodge with the puck to equal some of the best men players." The women's long skirts could be helpful at times. Players were able to crouch in front of their goalie with the hems of their skirts spread out and no shot was able to get past them to score a goal. 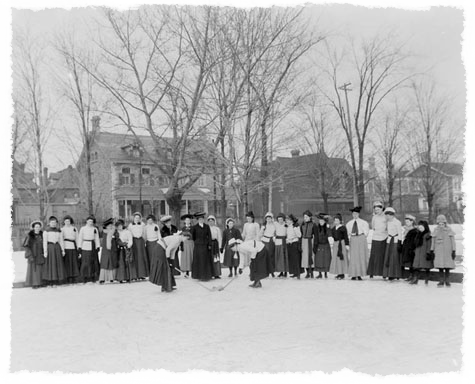 In 1894, college girls began to play hockey at McGill University. In 1900, the first known league for women was organized in Quebec, with three teams competing and spectators allowed to watch. Pictured Above: (Back) Flora E. Abernethy, Nelida Vessot, Jessie McArthur. (Middle) Muriel E. Whalley, Charlotte Whitton, Bessie Farrell. (Front) Bernice Clapp. Elizabeth Graham, a goalie from Queen's University, was the first hockey player to ever wear a mask in a game. In 1927, she put on a fencing mask to protect her face. In the 1930s, the Preston Rivulettes from Ontario were the Canadian champions for 10 years, winning 348 games and losing only two -- an amazing feat! In 1955, at the age of eight, Ab (Abby) Hoffman cut her hair very short and joined a boys' hockey team as a defenseman. Everyone thought she was a boy until just before an all-star game that required players to submit their birth certificates. When it was discovered that Abby was a girl, she became an overnight sensation. Soon other young women began trying out for boys' teams. By the 1990s, female players were registering for hockey in record numbers and invading the men's professional ranks. Three women goalies won games while performing on men's pro teams in the minor leagues. Manon Rhéaume was given a tryout by the Tampa Bay Lightning and played in a National Hockey League pre-season game. Bona fide World Championships for women were held in Ottawa in 1990, in Finland in 1992, at Lake Placid in 1994 and in Kitchener, Ontario in 1997. Canada won every game. 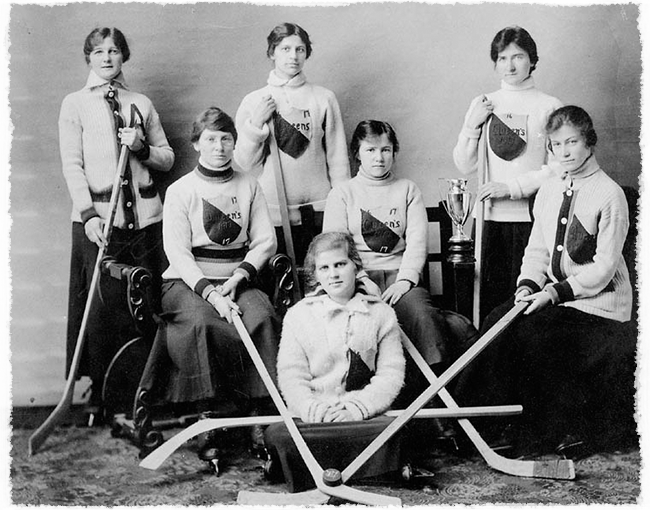 Then came the first appearance of women's hockey in the Olympics. At Nagano, Japan in 1998, Team USA beat Canada for the gold medal. Four years later at Salt Lake City, Canada won the gold. In 2006, Canada defended it's Gold medal by defeating Sweden in Torino, Italy. It's been quite a long road... so let's take a look back. Lord Stanley Preston, Canada's Governor General and donor of the trophy later named the Stanley Cup, floods the lawn of the Government House to allow his family - including his 2 daughters - to play ice hockey through the winter. 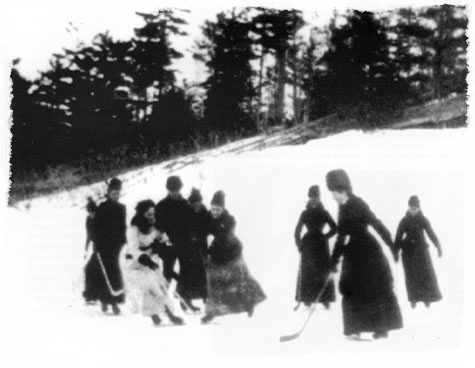 Isobel Preston, Lord Stanley's daughter, is photographed playing hockey in the first recorded image on film of a woman involved in the sport. The first newspaper account of a game of women's ice hockey appears in the Ottawa Citizen on February 11. Reports of the first game being held in Barrie, Ontario in 1892 are incorrect. The first female club team (the Love-Me-Littles) is formed in Kingston, Ontario at Queen's University. Women's teams are formed at McGill University and in the Ottawa Valley. The first female competitions to be held in the Maritimes involve the Reds & Blues and the Kananites from Nova Scotia. Picton wins the first Women's Provincial Championship held in Ontario. The first international women's ice hockey tournament is held in Cleveland, Ohio between American and Canadian teams. The University of Toronto defeats McGill University in the first intercollegiate women's hockey tournament (U. of T. won 11 titles through 1933, while Queen's University won two). Queen's University goaltender Elizabeth Graham donned a wire fencing mask to protect herself against shots to the face and became the first goalie to wear a mask (32 years before Jacques Plante set the standard for all future goalies). Canadian Intercollegiate League is disbanded during the Depression. The first Dominion Ladies Hockey Tournament is held in Brampton, Ontario with 22 teams. The Amateur Hockey Association of the United States (later named USA Hockey) hosts the first National Championship for girl's Pee Wee and Midget divisions. Taylor, Michigan wins the first Pee Wee National Championship and Wayzata, Minnesota captures the Midget crown. Senior Women are added to the USA Hockey National Championship with Assabet Valley, Massachusetts winning in the Senior "A" division and Cape Cod, Massachusetts capturing the Senior "B" title. The Canadian Women's National Championship is reintroduced. The Hamilton Golden Hawks defeat the Edmonton Chimos for the title. The first World Invitational Tournament is held in Mississauga, Ontario. The first International Ice Hockey Federation (IIHF) sanctioned Women's World Championship is held in Ottawa. Canada beats the USA 5-2 in the Gold medal final. Goalie Jenny Hanley of Hamline University in Minnesota becomes the first women to play on a men's college hockey team. Women's ice hockey makes its first appearance at the Canada Winter Games. Alberta won the Gold. Manon Rheaume becomes the first woman to play in the NHL during a pre-season match between her Tampa Bay Lightning and the St. Louis Blues. The IIHF and IOC vote to include women's ice hockey as a full-medal sport at the Winter Olympic Games at Nagano, Japan in 1998. Women's ice hockey is featured for the first time at the U.S. Olympic festival, held in San Antonio, Texas. USA defeats Canada in the 2-game series for the Gold medal. The first junior girls (U18) Canadian National Championship is held in Montreal, Quebec. Team Ontario wins the Gold. Minnesota becomes the first state in the U.S. to sanction women's ice hockey as a high school varsity sport. Erin Whitten, goaltender from Glens Falls, New York, becomes the first USA Hockey Women's Player of the Year. The first IIHF Pacific Rim Women's Hockey Championship is held in San Jose, California. The USA, Canada, China and Japan compete. Canada wins the Gold medal by defeating the USA in a shootout. The first 3-Nations Cup in Ottawa featuring the USA, Canada and Finland. Canada beats the USA 1-0 in the Gold medal final. Erin Whitten becomes the first woman to play in a professional game in a position other than goaltender. 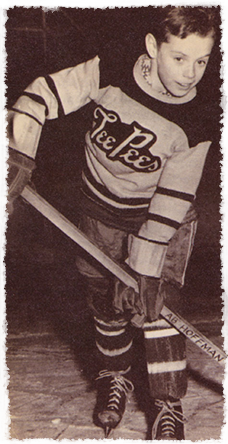 Whitten played as a forward for a total of 18 seconds as a member of the Colonial Hockey League's Flint Generals in a game against the Madison Monsters. Women's ice hockey makes its first appearance at a Winter Olympics in Nagano, Japan as a full medal sport. The USA, Canada, Finland, China, Sweden and Japan compete and Team USA wins the first Gold medal. Women's World Championship in Beijing cancelled due to concern over Severe Acute Respiratory Syndrome (SARS) in Asia. Women’s World Championships - Canada Win their 8th straight Gold Medal defeating the USA Team. Women's World Championship in Sweden, Team USA wins their first gold medal defeating Canada in a shootout. Olympics Games in Torino, Italy, Canada wins their second gold medal defeating Sweden. Women’s World Championship to be held in Winnipeg in March.